Alice Volpitta of Blue Water Baltimore beside the Gwynns Falls. In a park in West Baltimore, a spectacular arched stone bridge rises over a stream called the Gwynns Falls, which flows into Baltimore’s Inner Harbor and the Chesapeake Bay. Although the bridge is beautiful and trees beside the stream are blossoming, when you look at the stream, you see that the Gwynns Falls is troubled. A whirpool of sludge twists under the bridge, with a gyre of Styrofoam cups and plastic bottles. 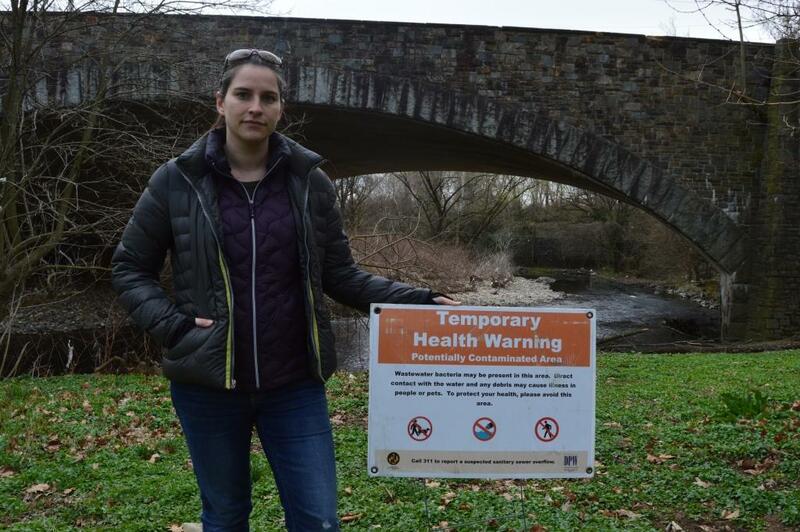 Alice Volpitta is the lead water quality scientist for Blue Water Baltimore, a nonprofit that is fighting to clean up this and other city waterways. She points to a sign and a sewer on the banks of the river. Sewage overflows are a well-documented problem in Baltimore, and Blue Water Baltimore has gone to court to try to force the city to fix the problem and comply with a federal consent decree to stop sewage leaks. But the organization is also contending with an even bigger issue – rising water levels. Volpitta points up into the trees lining the stream. Blue Water Baltimore partnered up with scientists at the U.S. Geological Survey recently to conduct a study of 20 years of water monitoring data on the Gwynns Falls. The study found that climate change is contributing to a significant increase in rainfall, with means higher river flows and more runoff pollution being flushed off the land and into the Chesapeake Bay. For example, in 1999, 40 inches of rain and snow fell at a monitoring station near the Gwynns Falls; and in 2016, it was 60 inches – or 50 percent more, according to the study’s data. Although there are annual ups and downs, in 1999, there were 20 rain storms – and in 2016, there were 30. According to U.S. Geological Survey, a general upward trend in rainfall has been happening throughout the Chesapeake Bay watershed for decades, with the northern bay receiving more of an increase than the southern. The Baltimore study found that investments in improved sewer lines and stormwater pollution control projects do work to reduce pollution. But even more investments in this pollution control infrastructure will be needed to compensate for the increased rainfall driven by climate change. There will be free food, drinks and music, and all are welcome.